Very bright light that is visible from a great distance. I use it on our group weekly rides during the day and I use it at night on short rides. This light has several bling modes that make it very visible. Most powerful rear light I have ever had. Great light as long as it's kept out of the wet. Appears to be a common issue based on other reviews I've read. It was a good six months. RIP. I seem to go through a lot of lights. Get tired of them, lose them, drop them, get them stolen. This light is outstanding. It's got a nice mount, is easily removable, is SUPER bright, has a great variety of modes. 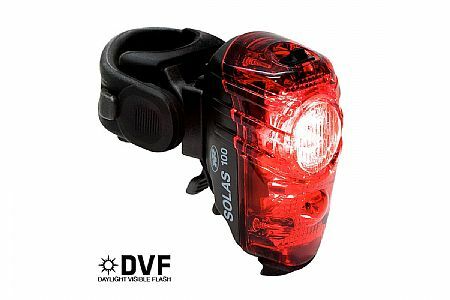 The best rechargeable taillight I've ever had (nothing will ever top my 15yo Planet Bike blinkie that looks roughly the same as this and still seems to be running on its original batteries). I like the pulse mode with a constant light and then a burst flash. Very visible. Easy to charge. Great light. I did make one mistake with it. In a slightly dark room I was plugging it in to charge and accidentally pulled out the setting switch cover rather than the USB connector. It was a major pain to get back in place. Not thrilled with this light mainly due to its function controls. I prefer a light that you can turn off in the mode you use and it will stay there when you turn it on again. This light requires you to cycle through the modes (OK, there's only 3 modes but still...) to get to the turn off mode. Other than that it's OK, good brightness. The battery life seems a bit less than my previous blinky. BRIGHT! light. Decent battery life, thought it is best if recharged after every ride, just to be safe. Bright tail light for day time. This tail light is nice and bright, on flash mode, for day time riding. On the flash mode setting it will last about 7 to 8 hrs before it needs to be recharged. Reason for only 4 stars is that it does take a while for it to fully recharge. Very easy to mount. Even easier to be seen. The different settings make for great options when riding solo, group rides without blinding people behind you or daylightnight riding. Easy to clip on and go. Plus it is easy to recharge using a standard USB port. Or if you have a converter, you can also recharge via electrical outlet. Since it is so bringt, being able to tone it down for group riding is important. This light works well and battery lasts longer than what I've used in the past. Have had this light for a couple of weeks. Had one of the earlier versions of this tail light and used it for 4 years till the clip broke and I lost it. This one is almost the same size and brighter. My only issues are the bracket (the older one had a seat stay mount included) and the run time Flash 1 is supposed to last 7 12 hours, mine has never made it past 3 hours and 20 minutes. Like to use it in the daytime and a couple of my rides during the week are longer than that so a little disappointing. This light has multiple attachment points. It is bright enough for daytime use. Nice flash modes. Bright and holds a charge. I had one on my bike that got stolen and used it for years. It is bright and holds a charge for 4 hours on blink. Got a new one for my replacement bike. Great light for day or night riding. Lasts about 6 to 7 hrs. I recharge it after every two rides for a total of about 5.5 to 6 hrs. I had the older version but lost it when it detached from its bracket. Newer version has an easier to use, and so far, much more secure attachment system that makes it much easier to move between bikes. The light itself is great - bright and flashes for hours. Good thing that I have two taillights since this one goes dead without any warning. This would be the best tail light if ownership would not keep ending in them smashing to the ground after falling off. I have used 3 of them on a road bike. All three times, a big bump sends them flying out of the clip. A car smashed one-gone. Another one tumbles into the roadside brush out of sight. Just can't keep buying them any longer. Might do okay on a soft tail or fat tire bike, but be warned.